This was a great romance and I loved Beatrix and Christopher together. Just good stuff. Everyone seems to love this one. Can't wait to read it! Great review Hilcia! I've been avoiding the "European Historical" like the plague lately but this book sounds lovely. I looks like I'm going to be adding 5 more books to my wishlist. Leslie I can see why everyone likes seems to like it. I know I did. Funny I thought Married by Morning was going to be my favorite in this series, and yet this was it! Novelnelle, thanks! I think Kleypas and Balogh are two exceptions ATM -- I've mainly be reading historical romance americana. 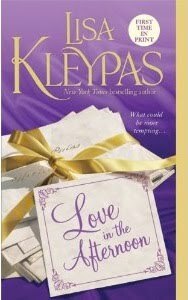 This was a good series by Kleypas, this book is my favorite. I love the letters between Beatrix and Christopher. I loved how they came together...however, I wished Christopher had apologized for the hurtful words he said about Beatrix. It seems the changed man excused the man he was before, how he was towards Beatrix before he got to know her. But that's just a small quibble. Good book and a great ending to the series! Yes, they were great! That didn't bother me at all Tabz. I think both Christopher & Beatrix apologized enough in this story, certainly for the important things, he for being rude, etc... and she for deceiving him. He certainly recognized the importance of words and how they can hurt and make a difference. Hils, did you feel, then that the book was pretty engaging the whole way through? I mean, I'm guessing yes since we've got this great grade here, but the thing that gave me the most pause on Dear Author's review is that DA Jane thought the book's tension kind of fizzled, leaving about half the book not as exciting. Did you find this to be so, from your perspective? KMont, from my perspective this story was excellent as a romance. There's romance, and then sexual tension during the first part of the book. The romance continues, there's still some sexual tension, plus you'll find sexual scenes during the last part of the book. So I thought Keyplas did a good job in balancing out the story in that respect. Also, the conflict between the H/H continue... and those are not resolved until the end of the story. Awesome, Hils, thanks. ;) I'm torn now whether to give the Kleypas before this one a go next or that Loretta Chase title I've got. LOL! If you're talking about Don't Tempt Me... then you have a tough choice. I really enjoyed that book too! I think I gave it a B+... I reaaally had fun reading and reviewing that book! Loved Zoe Octavia. I've only read the first two books in the series to date - I'm so in love with Cam (he's swoon worthy IMHO :) Not sure how keen I am on the fourth book, but I like the sound of the fifth. Do you think I can skip the fourth? Great review Hils :D You know how I feel about this book and I agree with you all the way LOL.